Over the years, we’ve made a couple of trips to Ross Moore Lake in our vehicles but we hadn’t actually made it to the cabin. Most anyone can get to the forest service site on the south end of the lake in just about any vehicle, but to proceed beyond that, you will need to walk or have a 4×4. 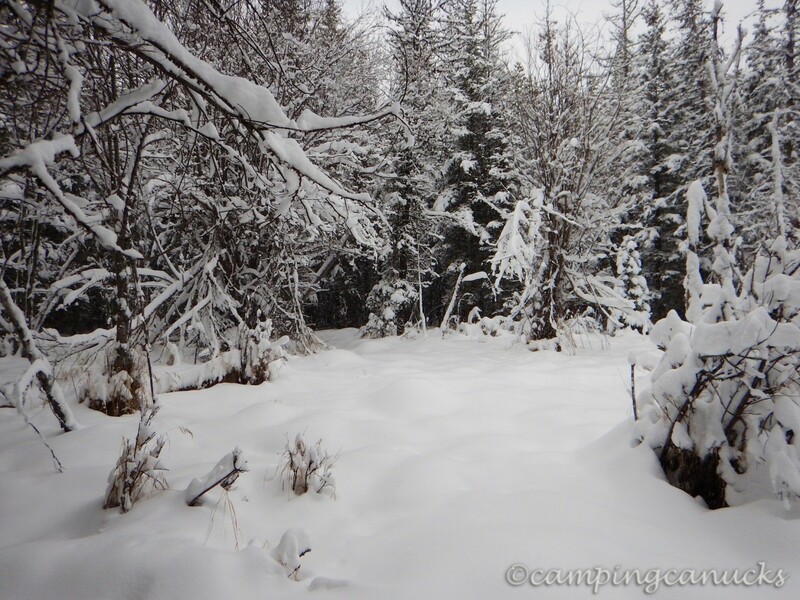 We figured a winter trip snowshoeing in from Lac Le Jeune would make a fine trip. Early in January, I headed out with a friend, Anthony, for the trip to the cabin and back. 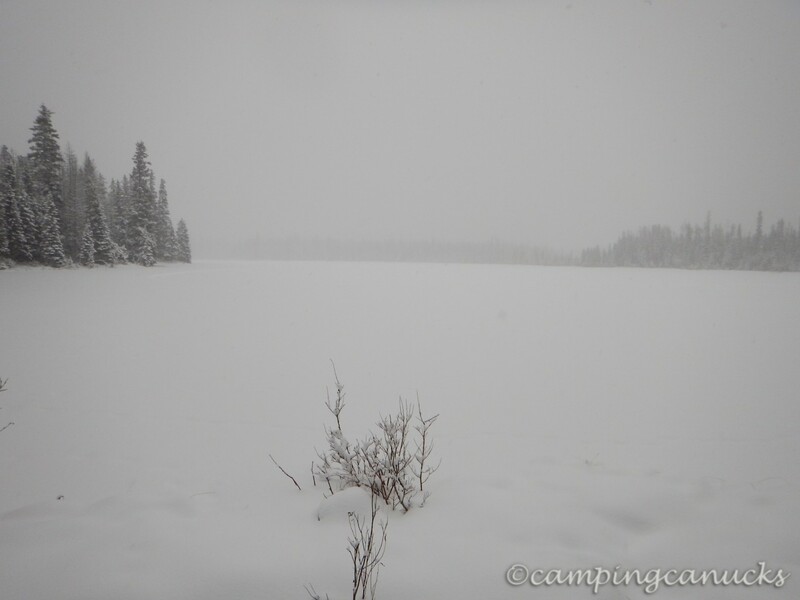 There are a number of ways to get there but we started our snowshoe on the eastern side of Lac Le Jeune at the end of the road. We figured we would save some distance and time by just cutting straight across, best we could, to Ross Moore Lake. We knew there would be some bushwhacking and detours but it seemed like it would be fun. And of course, with it being winter, we could just cross right over any lakes or bodies of water along the way. The day we hit the trail was cloudy, snowing, and about -20, so we planned on moving quickly to stay warm, with the intention of starting a fire somewhere later in the day and making a hot lunch. We had brought along both a stove and a tarp to build a shelter with if need be. We started off on the Gus Johnson Trail for the first bit as it was the easiest way to proceed. Eventually, we picked what looked to be a good road through the trees and just started heading southeast with Fred Lake being our first waypoint. It wasn’t really hard going but we did find that we got off course quite a few times along the way. It’s quite disorienting wandering around in a forest on a snowy, winter day when there are no visible landmarks, so we relied solely on a GPS to navigate. It would be quite easy to get lost if a person does not have any means of knowing where they are or in which direction they were heading. 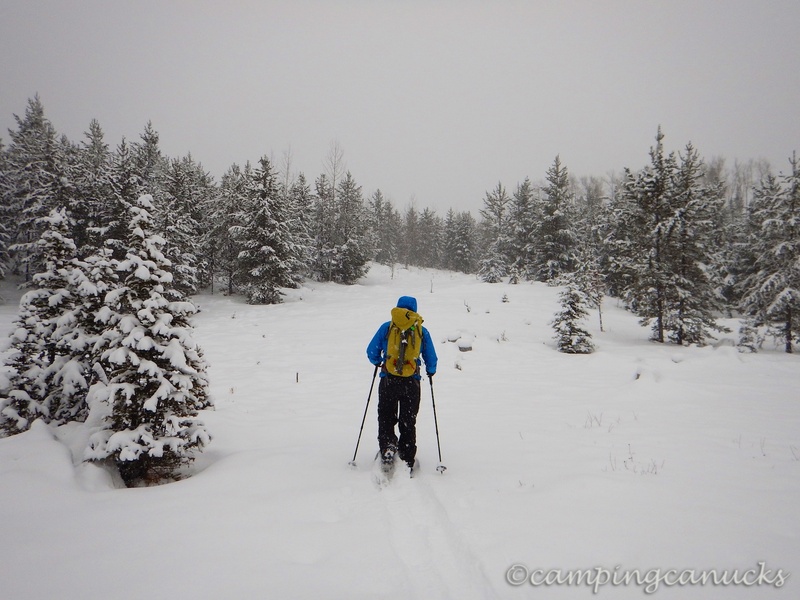 After some detours and a bit of just plowing through the brush, we emerged at Fred Lake. Being that it was quite windy (as there was a full-on snowstorm at this point), we cut across the lake and had a snack break on the eastern side before heading on towards Ross Moore Lake. Since we were just making our way as straight as we could, we next tried to follow a stream that runs out of Fred Lake to the east. In theory, a good idea, but in practice, we found the snow to be quite deep in many places, especially when there was long grass buried underneath. We also found that without constantly checking the GPS, we were in fact getting quite turned around while trying to find the easiest path through the forest. But we pressed on and soon found ourselves crossing Ross Moore Lake in a whiteout, although we could make out the cabin at this point and just headed straight for it. 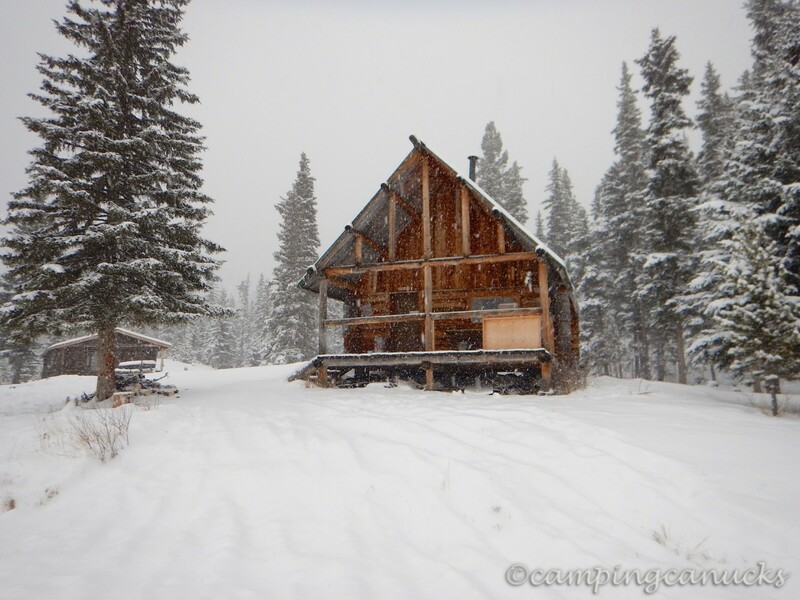 The cabin proved to be a great place to stop for lunch on a cold winter day. It was quite clean and well maintained inside and there was plenty of wood chopped up and ready for use. It didn’t take us long to warm it up inside and make ourselves a hot lunch. It was interesting reading through the log books that we found and getting the many stories of all the people who have visited the cabins over the years. But there were a number of logs reporting that the second cabin was haunted. I guess if we ever come up for the night, we’ll avoid that cabin. It was hard to get going again after settling in, but the time came for us to head on our way back. Luckily it had warmed up to -14 by this time. 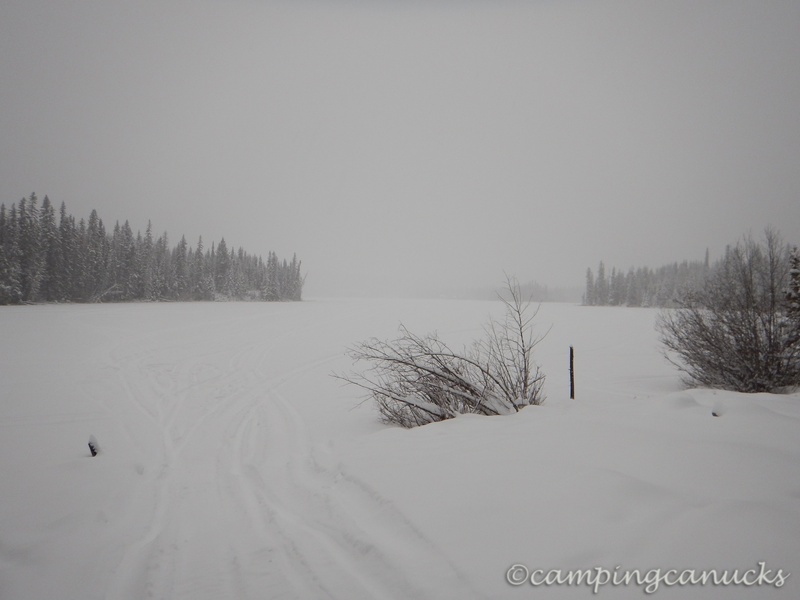 With our tracks being buried by all the snow coming down, we decided to cross the lake and try to hook up with a road that lead back to Lac Le Jeune. Since we had internet service on our phones, we took a look at a Kamloops Trails’ picture of a GPS track that was on the site and made a best guess as to where to head to. Once we crossed over to the west side of the lake, we were able to find what appeared to be a promising route heading west. After some more bushwhacking and a little bit of route finding, we were able to hook up with an old double track heading in the direction we wanted. As a bonus, sledders had made use of the track, so there was far less snow to worry about than what we had pushed through earlier in the day. We made good time at this point and were able to get back in less than an hour, which was about a third as much time as it took us to get to Ross Moore Lake in the first place. Granted it wasn’t quite as exciting as the trip out but it did lead us back to the Gus Johnson Trail. Once there, we elected to just cut over to Lac Le Jeune and follow along the edge of that lake rather than stick to the trails. There was quite a bit of snow on the lake but we were able to make good time by just following the tracks that the sledders had created and it didn’t take us long to end up back at our vehicle. This was a fun little trip and a great way to spend a winter day with the cabin being a nice treat on a very cold day. All told, it worked out to a bit less than 12km return. 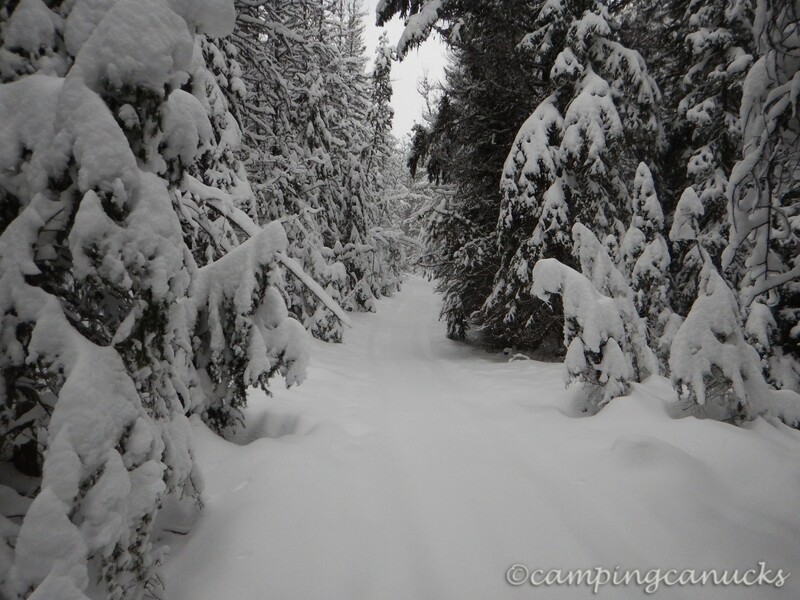 We wouldn’t recommend our route to the average snowshoer but for anyone looking for some fun navigating through the forest, it’s not a bad way to go. We do plan to come back again and we are planning to spend a night at the cabin, although in all likelihood we will not stay in the second cabin.